Fresh from a Lhotse summit last year, Xavi Arias is joining the crowds of Spanish climbers aiming for Annapurna in a few weeks time. 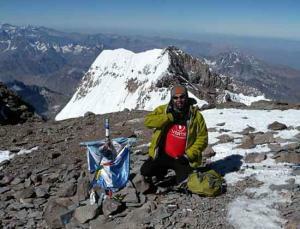 Xavi emailed ExWeb from Mendoza, Argentina just after topping Aconcagua. "Following my trainer's instructions, I climbed as fast as I could - and summited Aconcagua in 10 hours from BC (in great conditions), on January 23rd," Arias wrote. "I hope this will help on Anna. Another plus is that this time I'm not climbing on my own, but together with Lluis Rafols." Arias summited Lhotse without O2 last year, and Everest (on O2) in 2008. He attempted Annapurna in 2000.